Definition: images appeal to the senses (i.e. sight, sound, touch, taste, and smell) in order to recreate a person, scene, or object in the audience’s imagination. Through the use of imagery, artists also convey how they feel about what they are depicting. 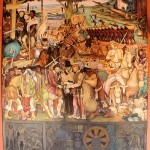 What ideas does Diego River’s mural “La Gran Tenochtitlan” communicate about Mesoamerica and the effects of European arrival to the continent? What images does he use to convey his perspective? How do these images contribute to your understanding about the importance of this moment in history to Mexican American identity? 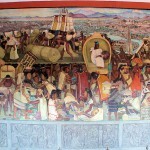 “The Great City of Tenochtitlan” by Diego Rivera depicts the accomplishments of the Mexica in what is now known as Mexico City. 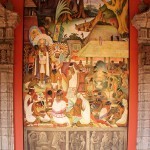 Specifically, the mural shows an Indian market with a vast array of goods available to residents of Tenochtitlan. In the background note the bast expanse of the city, including the complicated canal system built around Lake Texcoco. 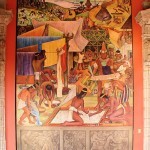 “The Purepecha Culture” depicts the cultural group which dominated much of Michoacan, some of Jalisco, and Nayarit. 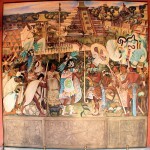 Purepechas were never part of the Aztec Empire, due to their fierce resistance against the Mexica’s efforts. 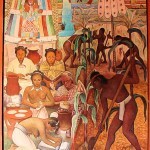 “The Zapoteca Culture” depicts the culture which today continues to thrive in the state of Oaxaca. 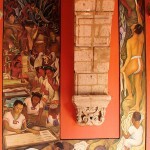 In this panel, the Zapotecas are engaged in ceramic arts, creating pots and other vessels. “The Totonac Culture” depicts the civilization which predominantly occupied what is today known as the southern state of Veracruz. Note the “voladores” in the background. The “dance” asking for rain from “Xipe Totec,” originated with the Totonac’s but continues to be performed today.